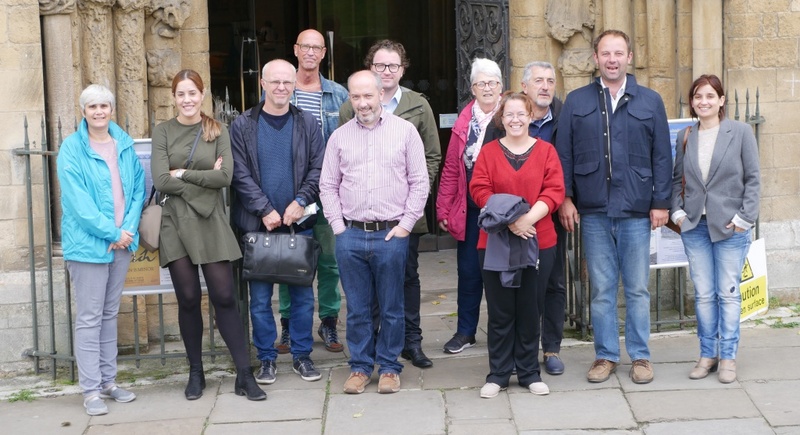 On 20th September 2017, the first steering group was held for the European project GALA in Diagrama Foundation’s head office in Rochester, England. The GALA Project (Gentle Art, Living Art) aims to empower vulnerable people. Diagrama Foundation is the lead partner in this project, which funded by the Erasmus Plus Programme (European Lifelong Learning, Adult Education measures) and has partners from four other European countries: Groep Ubuntu (Belgium), Association ProVita (Romania), Fundacion Diagrama (Spain), l’Art et la Maniere (France). Diagrama Foundation will be working with adults with learning disabilities at its residential home Cabrini House in Orpington and with the elderly at Edensor Care Centre in Clacton-on-Sea, Essex. International beneficiaries will include young offenders, victims of domestic abuse, homeless, and the elderly. The meeting began with Maureen Walby welcoming all the partners to the UK, followed by a short description from each partner about their organisation and what they do. This was followed by a presentation from Diagrama Foundation, giving an overview of the project, showing the proposed outcomes. Partners together agreed a set of objectives to reach by the end of the project, and how each partner will contribute. Partners then heard from representatives of Ubuntu in Belgium who explained their unique approach to empowering vulnerable people through art and how their resident artists with learning disabilities produced professional works to great acclaim. The partners will meet again by video call next month before the next steering group meeting and first training session for professionals working with vulnerable people, which will be held in Belgium in March.